APD and its partners want to recognize exceptional businesses from around the state that are committed to employing people with disabilities. We need you to nominate an exceptional employer now so they may be considered for an award. The exceptional employers will be recognized because their companies demonstrate an outstanding commitment to hiring individuals with disabilities. Visit apdcares.org to submit an Employer Award nomination. The employer recognition event will be held on October 4 with a celebration at Tallahassee City Hall, 300 South Adams Street. At the event, there will be informational displays, refreshments, and speakers talking about the importance of providing opportunities for people with disabilities to go to work. This free public event will be held at the Tallahassee City Commission Chambers on October 4, beginning at 8:30 a.m. Please plan to join us. ABLE United will continue to waive account fees through July 1, 2018, in celebration of the program’s successful first year. Since its official launch on July 1, 2016, ABLE United has provided more than 1,000 Floridians with disabilities a new way to save for a better life experience. ABLE United was made possible because of the passing of the Stephen Beck Jr. Achieving a Better Life Experience (ABLE) Act, which was signed into law nationally on December 19, 2014, and in Florida on May 21, 2015. The ABLE Act amended section 529 of the Internal Revenue Code to create tax-free savings accounts for individuals with disabilities. ABLE United is Florida’s qualified ABLE program, which was established to encourage and assist people with disabilities to save private funds to support health, independence, and quality of life. It allows individuals to save up to $14,000 annually without affecting benefits like Supplemental Security Income (SSI) and Medicaid while the funds in the account grow tax-free. Funds can be used on qualified expenses covering a wide range of categories including housing, transportation, and basic living expenses. Individuals must be Florida residents at the time of application and have a qualifying disability with onset prior to age 26. Opening an account usually takes about 15 minutes, and the individual with a disability owns the account, but an authorized person may open and oversee the account. There is no minimum contribution requirement, and you can save up to $14,000 per year – individually or with the help of family and friends. To find out more about opening an ABLE United account, please visit http://www.ableunited.com/. The Agency for Persons with Disabilities’ (APD) commitment to the awareness and prevention of abuse, neglect, and exploitation of those with developmental and intellectual disabilities is and has always been a top priority. Because we serve such a vulnerable population, abuse and its prevention has been a key focus for us. APD has a Zero Tolerance campaign to increase awareness and knowledge of how to prevent these horrendous actions. This campaign was launched in May to coincide with Adult Abuse Prevention Month and provides information on the signs and symptoms of abuse, ways to prevent abuse, and the proper steps to take when reporting abuse. Abuse, neglect, and exploitation can often go undetected in many settings. It cannot only occur in a professional care setting such as a group home or school, but it can also happen in a more personal, familiar setting such as one’s own home or the home of family or friends. APD has launched a social media campaign of tips every Tuesday utilizing the hashtag #SafetyTipTuesday on how to promote safety of those vulnerable to abuse, how to recognize warning signs, and how to proceed with proper actions. Be sure to follow our Facebook and Twitter pages to see these weekly posts. In celebration of National Foster Care Month in May APD launched a new initiative to find more individuals to become foster parents for children with developmental and intellectual disabilities currently in the care of the Department of Children and Families (DCF). APD and DCF will work collaboratively with the 15 APD Family Care Councils and the 18 DCF community-based care agencies across the state to encourage individuals to explore foster parenting. Foster parenting is a rewarding experience and gives a child the safe and caring home they need. The grassroots approach of linking potential foster parents with members of their local Family Care Councils will aide these parents in identifying resources and learning more about the overall experience of caring for a child with a developmental disability. As Director of APD, I am grateful to all the exceptional partners across the state participating in this new initiative to help children with developmental and intellectual disabilities find quality foster homes. I know the Family Care Council members will provide vital support to those interested in becoming foster parents. For support and information about fostering, you can get in contact with the FCCs by calling their toll-free number 1-800-470-8101. New foster parents will need to become licensed with DCF. For more information to help individuals learn about fostering or adopting, visit www.MyFLFamilies.com. The Clinical Supports unit at APD’s State Office collects data on all client deaths. Recently, a troubling trend was discovered: choking on food as a cause of death increased dramatically over a relatively brief period. 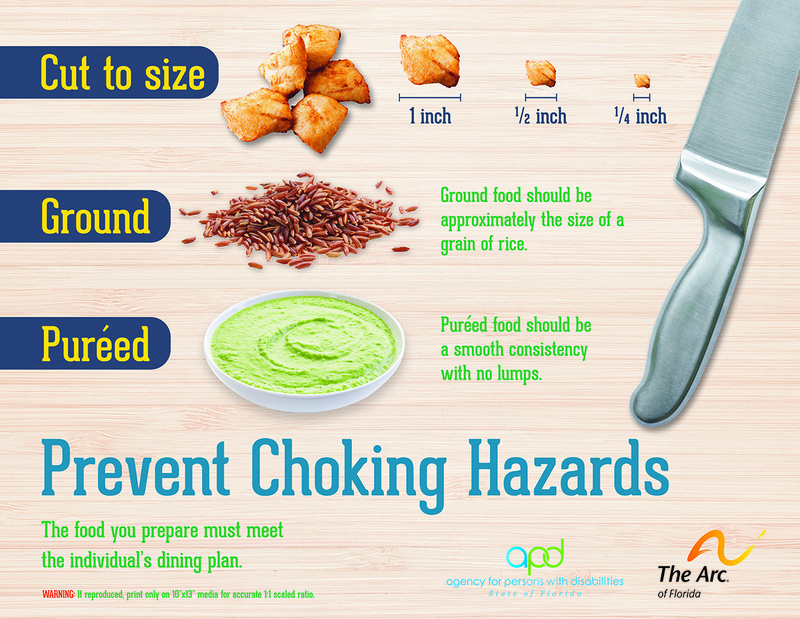 To address this, Registered Nurses in the Clinical Supports unit, with the generous financial support and assistance of the Arc of Florida, have created a cutting board that illustrates how to properly prepare food to prevent choking. The cutting boards visually show the most commonly ordered diet textures – pureed, ground, and cut to size – with true to size representations of ¼”, ½”, and 1” pieces of food. This will help food preparers ensure that the texture they are preparing is consistent with what is needed for an individual to eat safely. Medical Case Managers statewide will be delivering the cutting boards to group homes and adult day training programs, along with technical assistance on strategies to prevent choking on food, how to recognize choking, and reminders on what to do when someone chokes. The Family Care Councils will also be given a supply of the cutting boards to distribute. The cutting boards will help food preparers ensure that the texture they are preparing is consistent with what is needed for an individual to eat safely. Saving for the future is easy with an ABLE United account. It’s even easier if you win a $500 contribution toward an account. You could be one of five winners in ABLE United’s Summer Sweepstakes. Entering is easy and you can enter daily to win! Just register with your email, and then answer a few simple questions to earn entries. Sweepstakes ends June 15, 2017.